Organisms are comprised of interacting parts. Even within single cells, networks of proteins regulate basic functions. The impact of perturbing one part of an organism—for example, via genetic mutation—can often be modified by perturbation to other parts. This creates an obstacle for scientists: How do we predict traits from genetic data when the same mutation can have different impacts? This also presents challenges during evolution: How does an organism adapt or evolve when changing one trait can influence many other traits, resulting in complex tradeoffs? To quantify the spectrum of effects that a specific perturbation may have on an organism, the Geiler-Samerotte lab measures how yeast cells respond to subtle genetic or environmental changes. Then, we study how cellular responses change when multiple perturbations are combined or when the magnitude of a perturbation is systematically varied. Our research provides insight into how interactions between small-effect genetic variants shape the evolution of complex traits. Being a part of GSA has advanced my career by bringing me so many opportunities to present my research and engage with fellow scientists. In particular, in 2013 I was awarded the DeLill Nasser Professional Development Award to travel to a Gordon conference on Ecological and Evolutionary Genomics. I also especially enjoy the GSA Yeast meeting, as well as the new GSA meeting on Population, Evolutionary and Quantitative Genetics. These meetings have provided me invaluable opportunities to hear about the latest research in the field and to get feedback about new results. In the fall of 2019, I am very excited to co-teach my first course with fellow ASU professor Susanne Pfeifer. We will be implementing the HHMI Science Education Alliance program, “Phage Hunters Advancing Genomic and Evolutionary Science,” at Arizona State University for the first time. In this year-long intensive course, undergraduate STEM majors will actively engage in research to discover, isolate, and computationally analyze bacteriophages—with the Fall semester being wet-lab focused and the Spring semester being dry-lab focused. The course is designed to provide students with an authentic research experience where they gain a sense of ownership of the scientific problem and of the discoveries made. I am recruiting technicians, PhD students, and postdocs. My lab’s research lies at the intersection of cell biology, evolutionary biology, and genetics. Thus, I am interested in recruiting people with training in any of these different backgrounds, particularly people who are interested in bridging disciplines. The Center for Mechanisms of Evolution, with its diverse expertise, is a phenomenal place to explore the intersection of these fields. If using insights from cell biology to understand complex genetics and evolutionary phenomena sounds appealing to you, please drop me a line at kerry.samerotte@asu.edu. 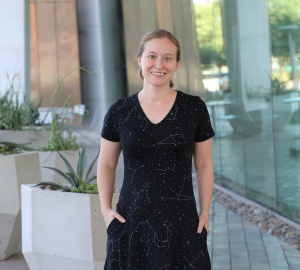 I only just started as a faculty member in January of 2019, and my favorite thing about the job so far is getting to know the amazing community of biologists at Arizona State University. In particular, the community of evolutionary geneticists in Arizona is extensive, and I am having a blast hearing about all of the cool research going on in my new home. When I’m not at work I brew beer using my favorite model organism, budding yeast. Dr Geiler-Samerotte is a budding superstar! !